Perpetual has announced Nicolas Chen as the winner of the prestigious $50,000 A.M.E. Bale Travelling Scholarship, managed by Perpetual as trustee of the Alice Marian Ellen Bale Art Foundation Trust. The A.M.E. Bale Travelling Scholarship and Art Prize is awarded biennially to emerging Australian artists who have demonstrated talent and achievement in traditional styles. Over 190 submissions were received for the prize pool this year, valued at $60,000 in total. Caitriona Fay, General Manager, Community and Social Investments at Perpetual said: “This year marks the 30th anniversary the A.M.E. Bale Travelling Scholarship and Art Prize have been awarded. The travelling scholarship is a premier award and sought-after prize for up-and-coming artists keen to build their career. The recipient of the scholarship, Nicolas Chen, said he was extremely grateful to be given this opportunity to combine his passion for art and travel. Based in Melbourne, Mr Chen has always been dedicated to his own personal study and exploration, drawing and painting full-time for the past 11 years. He began his formal training at the Julian Ashton Art School in 2007 and received a full-time scholarship in 2009. Upon graduating in 2010, Mr Chen continued further study abroad at the Florence Academy of Art from 2011 to 2014. Mr Chen has many notable achievements, including being a Cambridge Studio Gallery Portrait Prize finalist this year, a Cliftons Art Prize finalist and Doug Moran National Portrait Prize Semi-finalist in 2015 and previously an A.M.E. Bale Travelling Scholarship finalist in 2014. “Over the past four years, I have been working independently on my own artistic development away from a school environment. This has provided me with ample time for reflection on my work and has given me greater clarity of what I wish to achieve artistically in both the near and distant future. Mr Chen intends to use the $50,000 scholarship for intensive study and workshops in France, tour selected art galleries and museums across Europe and America to study old master paintings and use the experience from his travels and studies to create artworks to exhibit and share with the public upon his return. In addition to the main travelling scholarship, two art prizes valued at $5,000 each are also awarded biennially. 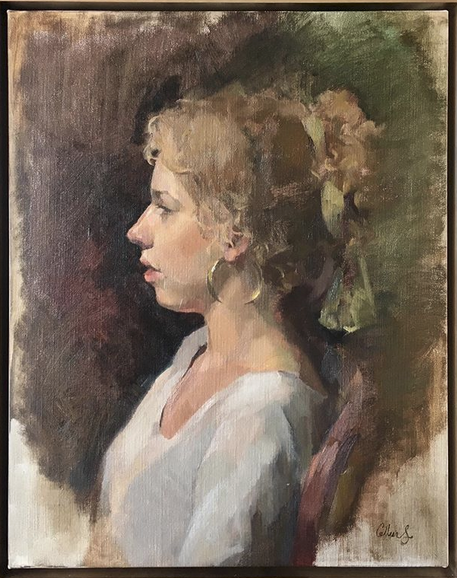 The 2018 A.M.E. Bale Art Prize in the medium of oils and/or acrylics was awarded to Colleen Stapleton for her painting of Girl with a hoop earring and the 2018 A.M.E. Bale Art Prize for works on paper was given to Byron Copland for his work Double Portrait Study. The exhibition of finalists is on display from now until 9 December 2018 at the Glen Eira City Council Gallery in Melbourne.